After Maxi (our beautiful Springer Spaniel) went to sleep for the last time in May of 2002 we vowed not to have another dog as it would be far too painful if something happened to it. Also, as we were both out at work during the day it would be unfair to expect a dog to stay at home all alone during the day. 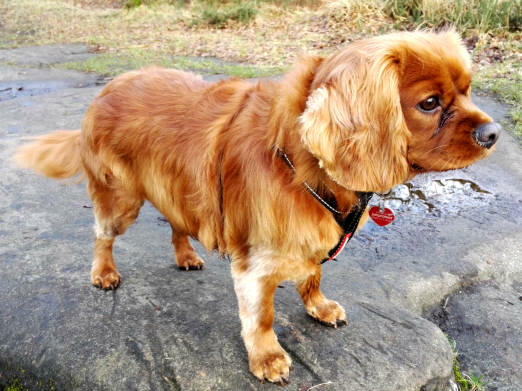 When we had Maxi I was working at Wirral Metropolitan College's Wallasey and Birkenhead campuses and could come home during my lunch break to make sure that he was alright, give him a bit of "fuss" and take him for a quick walk in the park at the end of our road. 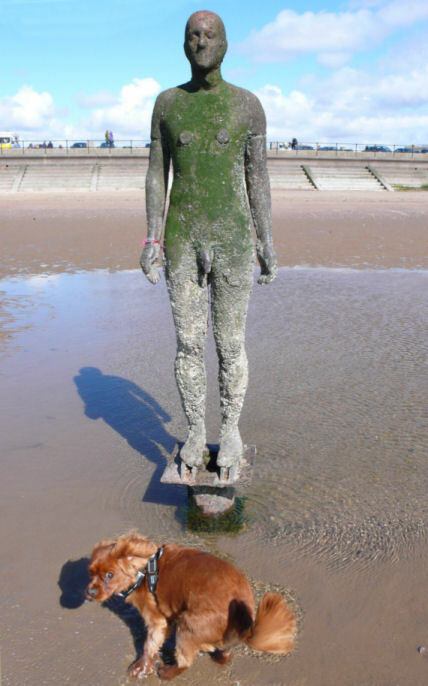 With my being transferred to the College’s Carlett Park Campus at Eastham... half way down the Wirral Peninsula, it would have been too great a distance to travel home during my lunch break and so a canine companion would have to wait until one of us retires from working life. But that is not to say that we haven’t been tempted! 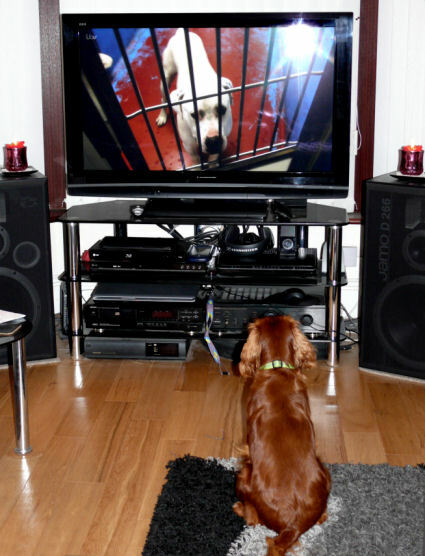 In the meantime we watched all the episodes of Paul O'Grady's "For the Love of Dogs"/Dog Rescuers/Supervet/Dog Whisperer and other dog-related programmes on television. Anyway... we had plenty of friends and family whose dogs were only too eager to give us a lick and a cuddle (see the Canis Canalus section of the Canalscape website). 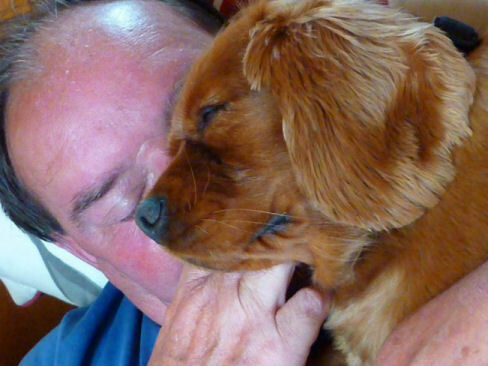 But things do change and that is what happened when Ruby came into our lives. 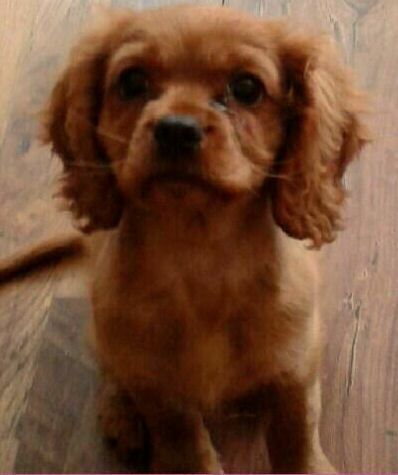 Whilst I was off work ill in July 2015 we were asked to look after our grandaughter Shannon's dog called Ruby for a couple of weeks. This was due to an impending new baby in Shannon's home and their lifestyle not really being conducive to having a dog in it. 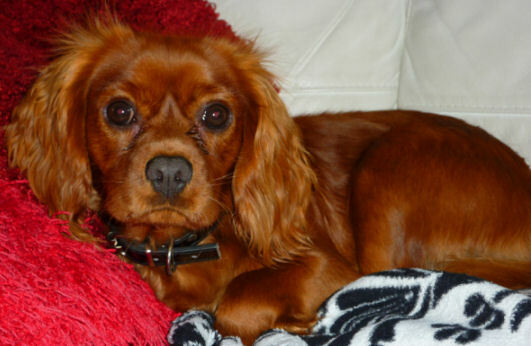 The alternative was for Ruby to be re-homed where Shannon would not see her which would break Shannon's heart. 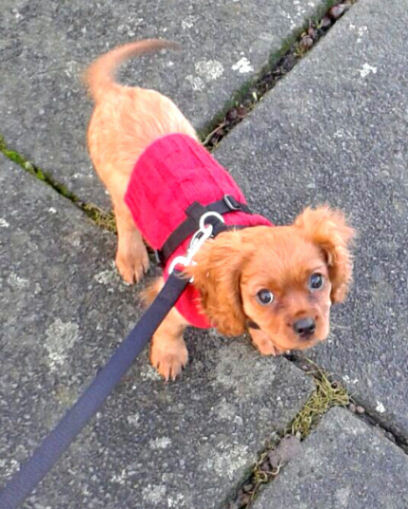 Ruby is a ruby coloured (hence the name) Cavalier King Charles Spaniel and was nine months old when she came to stay with us. 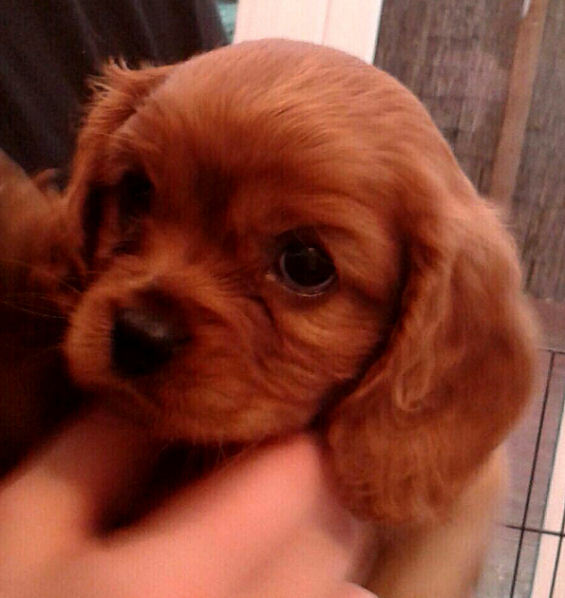 Below are a few photographs of Ruby when she was a small puppy before she came to stay with us. 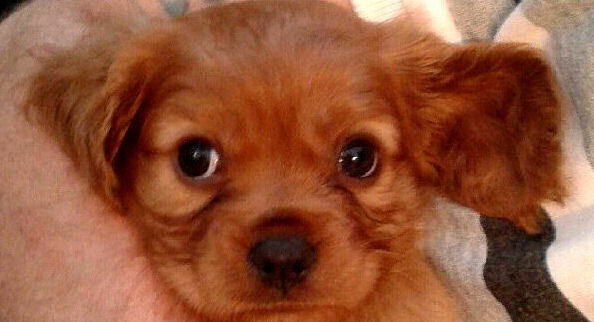 When Ruby first came to stay with us she was quite timid. She had not been introduced to other dogs or humans and would shy away from them all. 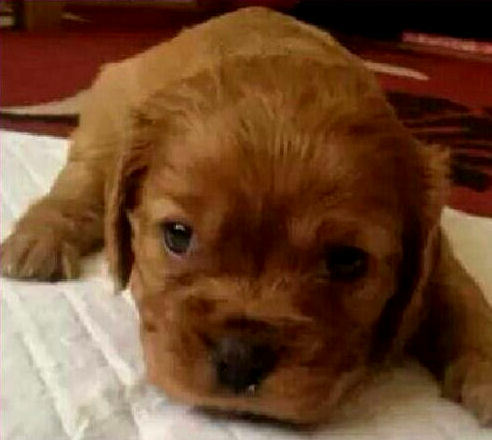 The first few weeks were spent socialising her. When out for a walk if we met other dogs I would explain that she was timid and ask the owners if she could say hello. 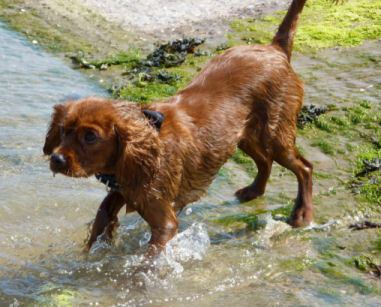 On one occasion when Ruby had been with us for a week or so we met a lady walking four dogs on the beach near Manor Lane in Wallasey and Ruby reluctantly allowed the other dogs to sniff her. I met the same lady a couple of weeks later and she could not believe that Ruby was the same dog. She walked up to the other dogs and didn't shy away or make any attempt to run from them. The lady couldn't believe that it was the same dog and was complimented me on the good job that we had done with her. 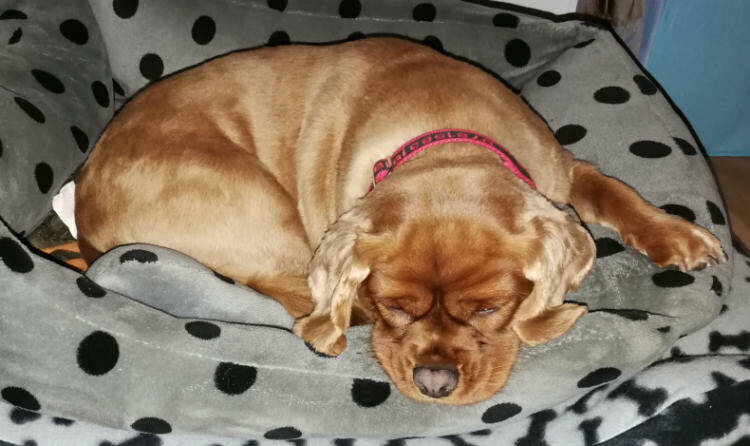 Whilst being off work it was not a problem Ruby living with us as she was not left alone for any length of time, had at least three walks a day (beneficial to my health as well as hers) and she fitted into our family well. The two weeks turned into six and the time was quickly approaching when I would have to return to work, The doctor told me that I would have to address my work/life balance so I decided to take "flexible retirement" which basically meant that I worked part-time... mornings only, drawing my company pension to supplement the lower salary. The upshot of this was that Ruby would be able to come and live with us permanently as she would only be alone for a few hours in the morning. A couple of weeks later, because she had fitted into our way of life so well we were asked if we would like to keep her on a permanent basis to which we said yes. We had to change her ownership details with the vet, microchip company, etc. 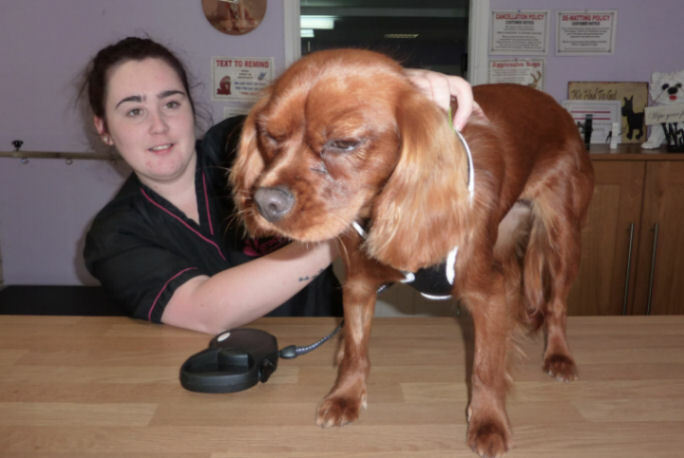 and arrange pet insurance When registering her with the vet the receptionist informed me that we were already registered with them and that according to their records we had a twenty four year old Springer Spaniel. This statement tugged at my heart strings and brought tears to my eyes as I remembered our beautiful boy... Maxi. 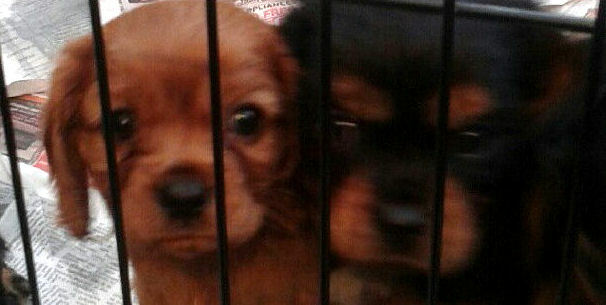 Whilst on the telephone to the vet we also made arrangements for her microchip details to be (eventually) changed to us. 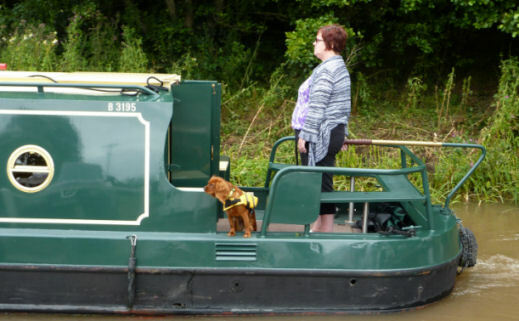 When we introduced Ruby to the boat we were impressed with the way she took to it... not being phased by the sound or vibration of the boat's engine and not trying to jump into the canal at the first opportunity (unlike Maxi). 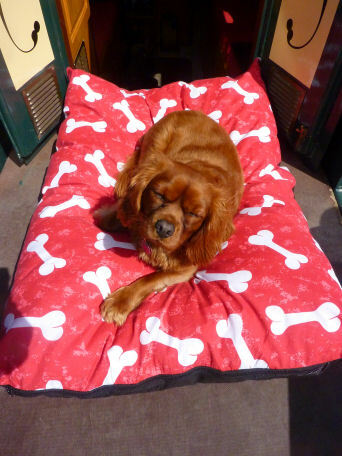 She is just the right height to walk beneath the seating on the boat's rear deck... when the sun is shining she can sit down beneath it being shaded from the sun and when it is raining she can also shelter from the rain although she does have her own waterproof jacket! 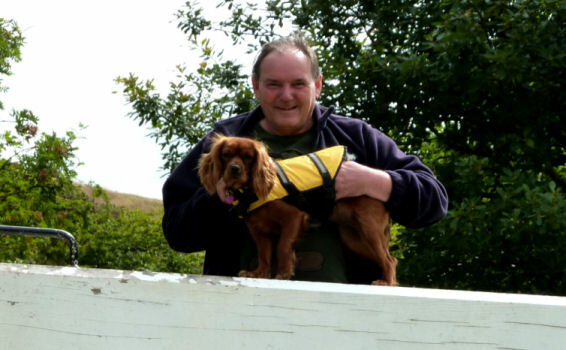 Even though Ruby had paddled in the sea at Harrison Drive (just past New Brighton on the Wirral's coastline) we would feel happier if she had a buoyancy aid just in case she fell into a lock or somewhere that it was difficult for her to climb out of the canal. 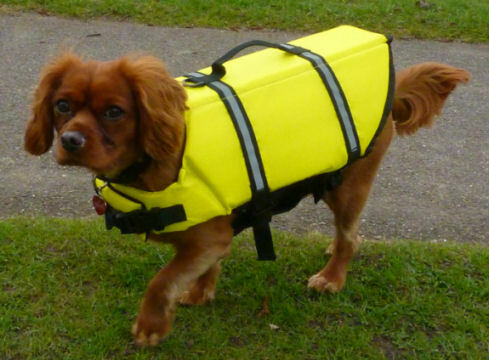 Accordingly, just before we went on our 2015 Summer Holiday Cruise we purchased a dog buoyancy aid from Thorn Marine at Stockton Heath. Nigel Hamilton helped her to "try on" a couple of different types and sizes. 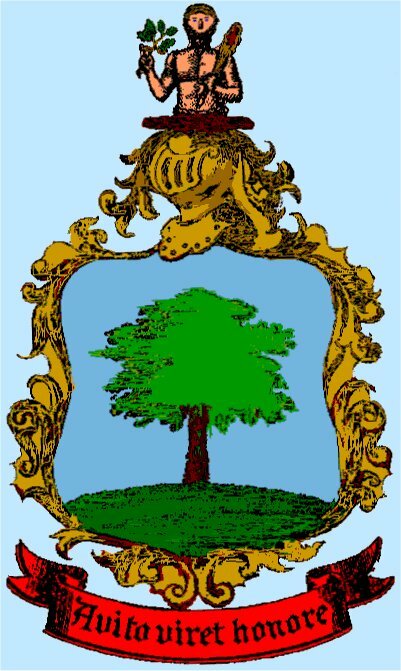 Eventually a medium size was settled on as being the best fit. On her first Summer Holiday Cruise holiday with us she initially barked at ducks on the canal but by the end of the two weeks she just looked at them with mild curiosity. 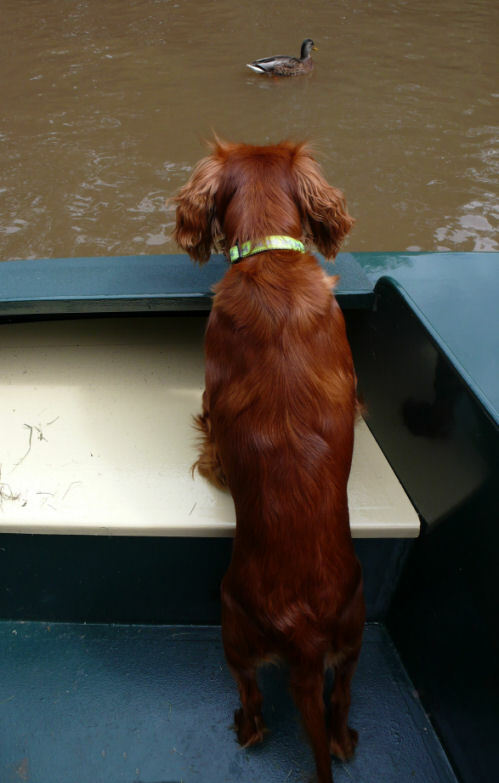 She usually stands with her front paws on the rear deck gunwales... alternating sides whilst she takes in the sights, sounds and scents of the canal. 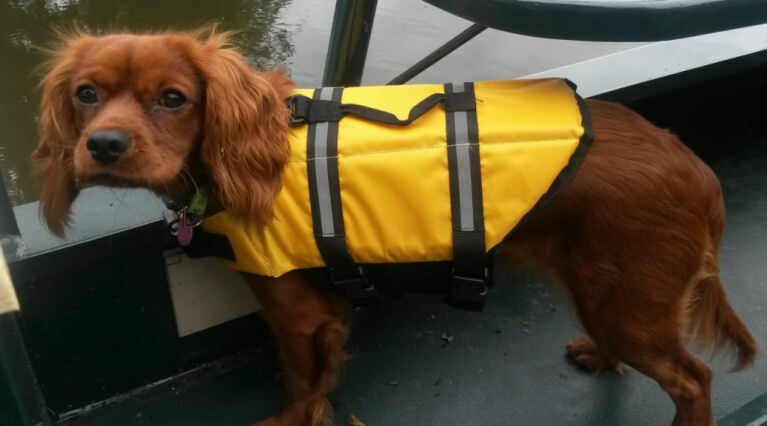 With her having a buoyancy aid we decided to trust her off the boat whilst passing through locks and allow her to walk around the lock provided that there wasn't a road or any other hazards around. This trust proved to be well founded and she is well behaved (as usual) when we are at locks. She also enjoys accompanying me when I am out taking photographs as can be seen in the photograph below when we went into a wheat field to take photographs near Barbridge on the Shropshire Union Canal. She has since accompanied me on many photographic excursions. She has to be watched though... just in case she finds something nice and smelly to roll in! This holiday held another couple of firsts for Ruby. Her first trip on a bus and her first visit to a dog friendly café. 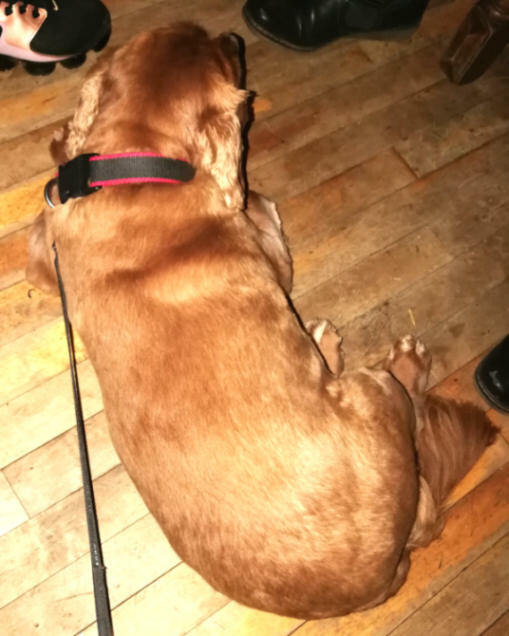 On both occasions she behaved impeccably and since then we have not had any qualms at all about taking her into places where well-behaved dogs are allowed. Not long after we returned home from our holiday we arranged to have Ruby spayed. The vet told us that she was to have lead exercise only with no running or jumping for a couple of weeks whilst her stitches healed. Try telling an eleven month old pup not to jump or do anything energetic! The day after her operation she was not too impressed with us but made up for it the next day by being back to her normal bubbly self. After a couple of weeks she was given a clean bill of health and could resume her normal energetic lifestyle... you cannot even see the scar! On the 21st September 2015 it was her first birthday. 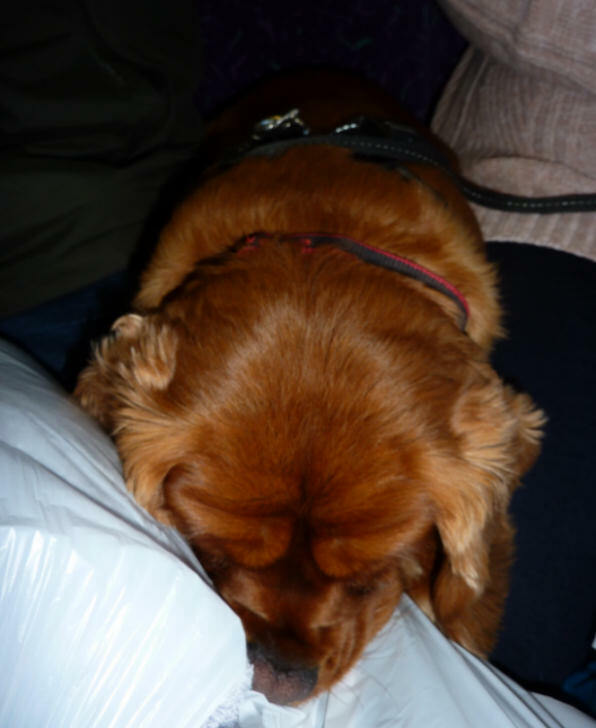 When I came home after visiting Pets at Home with her presents she put her head straight into the carrier bag and wouldn't give me any peace until I had given her her presents. 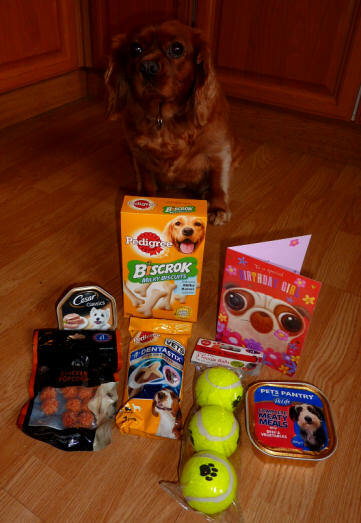 But she couldn't open them until Ange came home from work and then enjoyed a special birthday tea of "Applaws" posh dog food! 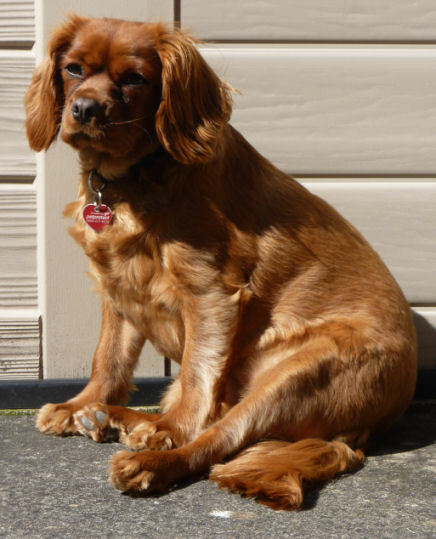 Ruby has a great personality and she makes us laugh at her antics. 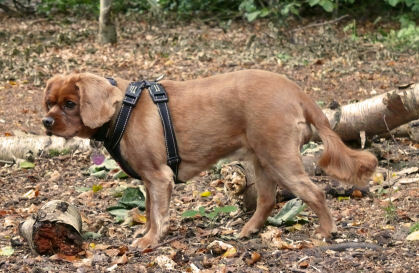 Normally she is quite a patient dog but when playing with her ball, if it is not thrown quickly enough, she will flick one of her back legs backwards to show that she is becoming impatient. She also uses her front paws to hold things more than any other dog we know and has the ability to grasp an item with her "fingers". Her favourite soft toy was regularly being chewed and Ange sewed it back together on numerous occasions. In the photograph below she can be seen watching Ange and waiting patiently for her favourite toy to be repaired and returned to her. She gives great cuddles and has the knack of squeezing into the smallest of spaces making sure to maintain body contact so that she knows when you move. We are conscious of her breed being prone to putting on weight so we try (and with those big brown eyes we sometimes fail) to restrict her food quantities and treats to ensure that she maintains her figure (unlike the rest of us). Having said that she does like McDonalds strawberry milkshake and Asti Spumanti (see photographs below). 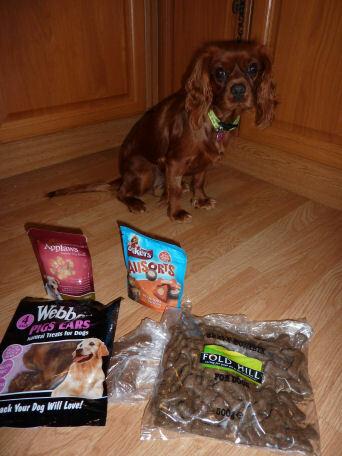 Her preferred food is Wainwright's Mixed Varieties moist dog food available from Pets at Home but decided to add a small quantity of Wainwright's dry variety mixed in with the moist food which she seems to like. This combination doesn't provoke any allergy problems, helps to keep her beautiful teeth clean and keeps her at the correct weight provided that the serving size is monitored. ...and McDonalds strawberry milkshake as well! 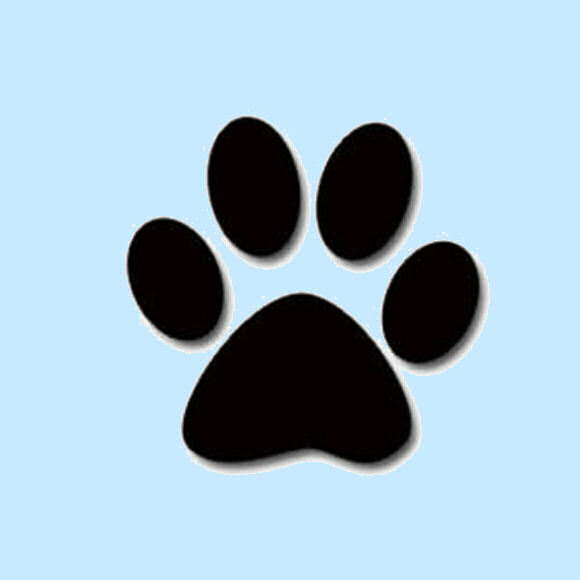 We are great believers in canine stimulation and play numerous games including "Go Find" when she is asked to go out of the room (no peeping) whilst a treat or ball is hidden and then is asked to come back into the room to find it... which she always succeeds. 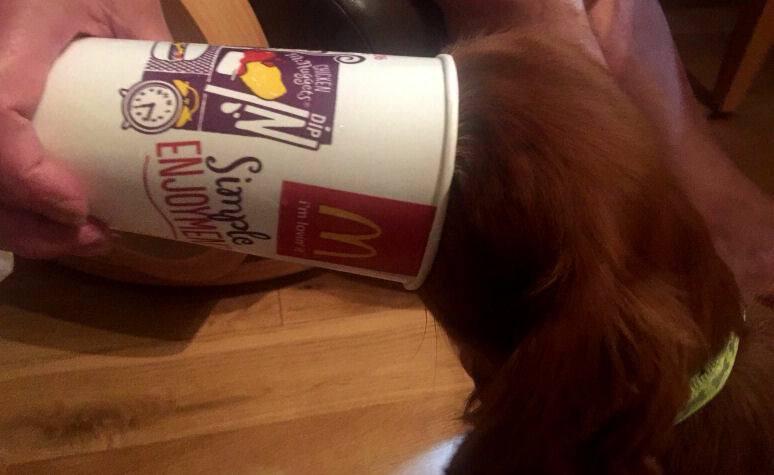 In another game three plastic cups are placed on the floor, one of which has a treat hidden beneath it. 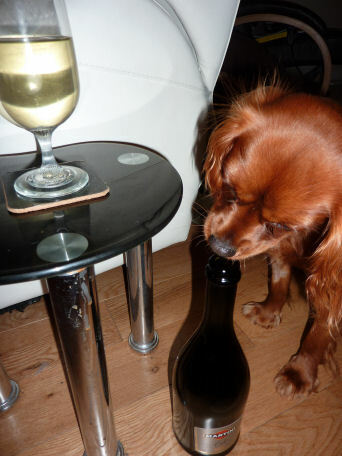 The cups are then mixed-up with Ruby watching and she then has to tip over the cup containing the treat with her paw. With dogs possessing a nose that is forty times more sensitive than ours it comes as no surprise that she always finds the treats! Yet another of her favourite games is when we put a few treats in a polycarbonate drinks bottle minus the top ("bottul"). Ruby will then enjoy chasing the bottle around the floor for a while and then spin it so that the treats come flying out. How does a dog learn about centrifugal force? It never cease to impress me with how they can achieve tasks that we as humans take for granted. Ruby likes cats and only wants to say hello and play with them. The only problem is that they do not want to play with her except for a select few which includes Rory... the three legged cat who lives opposite us, the black and white moggy she sees every morning on the way to the park and Rosa (more of whom later), who know she will not be aggressive towards them. We have a gas fire that has a mirror-like black glass surround and quite often Ruby will look at her reflection either as she walks past it. We have even observed her looking at her reflection in shop windows as we walk past them... vain or what! Ruby has quite a lot of toys... in fact more toys than any other dog we know. She has a favourite cuddly toy (her "baby"), numerous hide chewy bones, "squeakies", "tuggers" and "lobbers", "squeakeee ball", "littul (sic) ball" "duck duck" and "bottul" (sic)... (the previously mentioned clear, polycarbonate pure orange juice bottle that we place treats in for her to chase around). She will get a toy when asked for instance "Where's duck duck" and has even started putting them back in the basket! 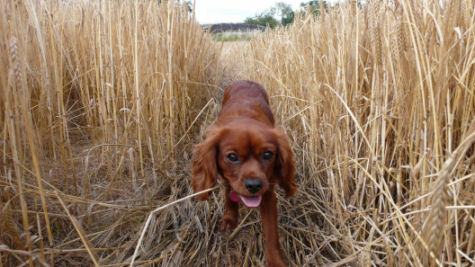 Ruby is very ball orientated, loves playing fetch and is quite skilled at catching with her paws as well as her mouth. When playing fetch she will bring the ball back and either "throw" it to us, drop it at our feet or even place it in our hands. A relatively new game involves the ball being thrown up the stairs, Ruby running after it, retrieving the ball and standing at the top of the stairs and then "throwing" it down them ready for the process to be repeated and then running down the stairs after the ball. Sometimes she will follow the ball down the stairs and when it is thrown up for her to follow she will pause to see if the ball stays at the top of the stairs or comes bouncing down again. If it stays at the top she will then run up the stairs to pick it up. If it bounces back she will catch it mid-bounce and carry it back up to the top then "throw" it down for the process to be repeated. We have even observed her doing a modified version of it all on her own for about a quarter of an hour non-stop! 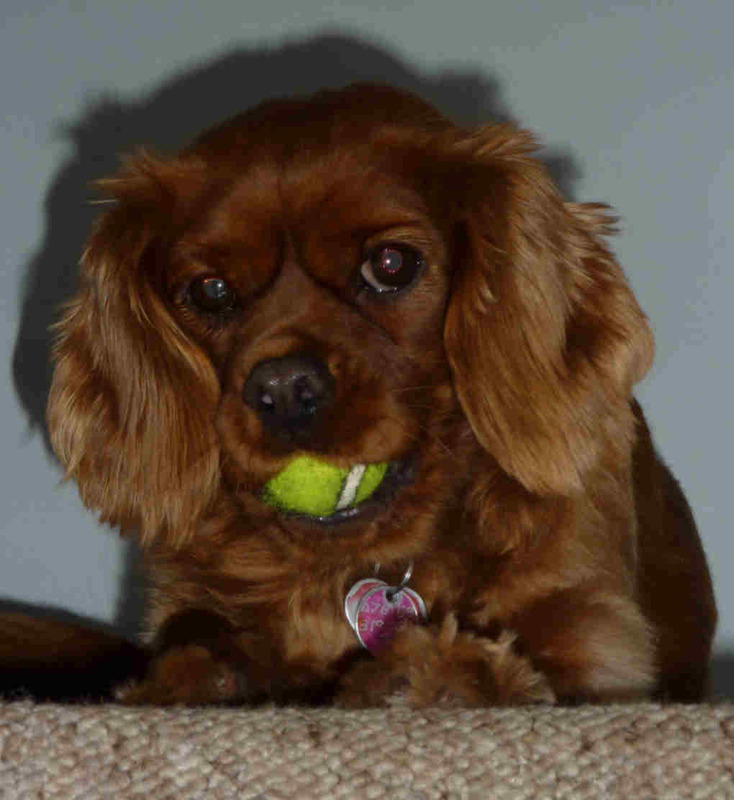 In the modified version she stands at the top of the stairs, dropping the ball so that it bounces down them and Ruby running after it, picking it up and taking it back to the top of the stairs and repeating the process. She also enjoys running after a tennis ball thrown on the beach or, provided that the grass is not too long, in the park. 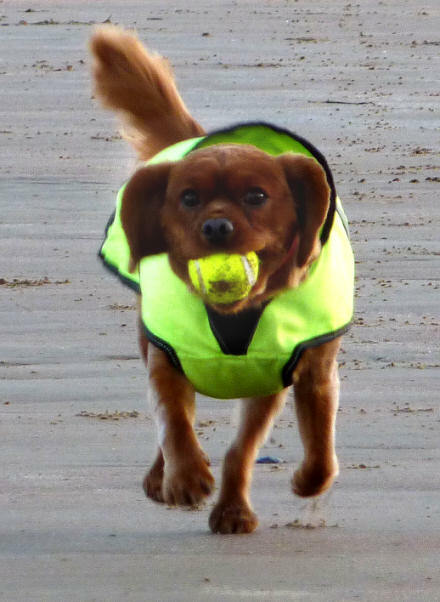 Recently, whilst running after her ball on the beach she was being watched by another Cavalier King Charles Spaniel owner who told me that he had never seen a dog of this breed run as fast as Ruby does! Whilst in the park she also enjoys chasing squirrel's (the tree dwelling variety... not me!). She has only got close to catching one once and that was because it stopped and she ran over it. I suspect that it gave her a nip on the leg at the same time but it hasn't deterred her from this pastime. One thing that amuses Ruby are feathers. 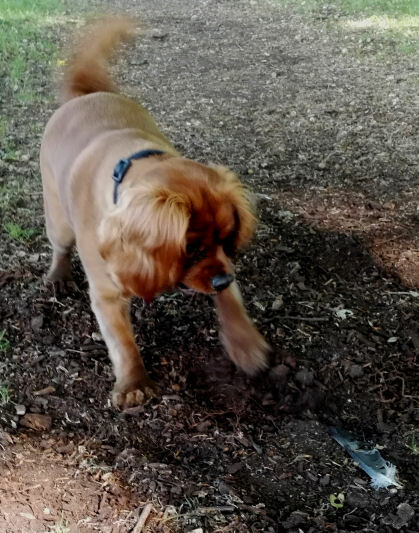 She will play for ages chasing them and recently walked sideways for about a hundred metres along the bank of the lake in the park watching the progress of a feather as the breeze made it drift... funny dog! Ruby seems to enjoy watching TV especially when there are dogs or other identifiable quadrupeds like horses and cattle on the screen. She will sit or lie on the rug in front of the TV with her back legs stretched out behind her for the duration of the programme. Some dogs will glance at the screen for a few seconds before their attention span gets the better of them but Ruby will sit captivated and apparently, understanding what is being shown, even barking at the TV on occasion. 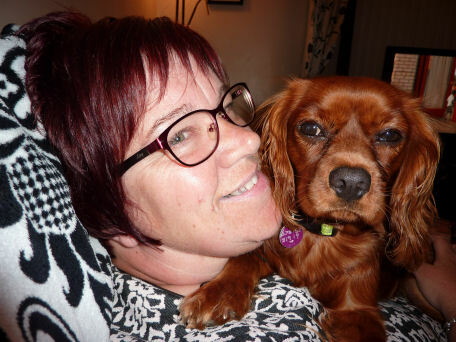 Her "favourite" programmes are Paul O'Grady's "For the Love of Dogs" (see below), "Supervet" (with the wonderful Noel Fitzpatrick), "Flock Stars", the "Dog Rescuers" and "The Dog Whisperer" with Ceser Millan. 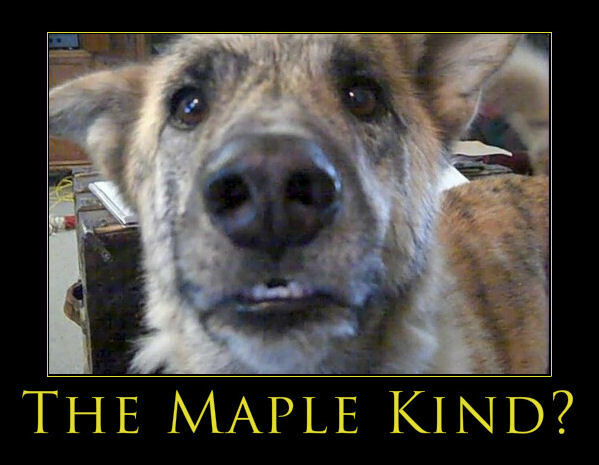 But if there are any whippets on the screen she will growl and bark at them as she does not like this particular breed of dog either in the flesh or on TV, She also has a predilection for a certain YouTube video showing a German Shepherd having a conversation with his owner about maple smoked bacon and the cat and is entitled... "The Maple Kind". 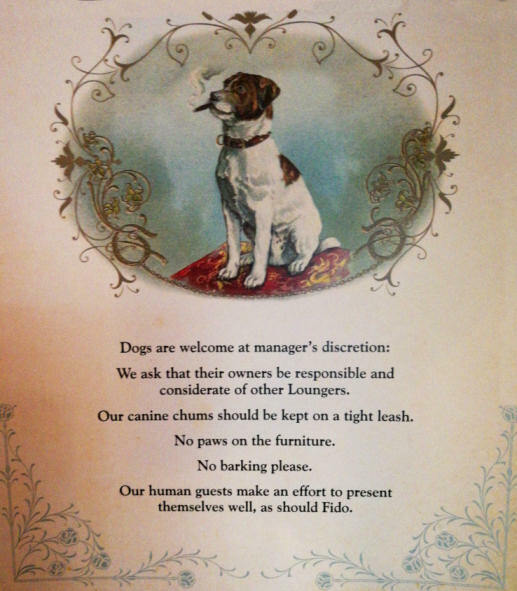 Have a look at it... it's a classic that every dog lover will enjoy. Watching Paul O'Grady's "For the Love of Dogs"
When I come home from work, after lunch, if the weather is fine, we go for a walk on the shore or visit one of the local nature reserves. Her ball usually accompanies us and she loves it being thrown, chasing after it and then dropping it at my feet ready for it to be thrown again. 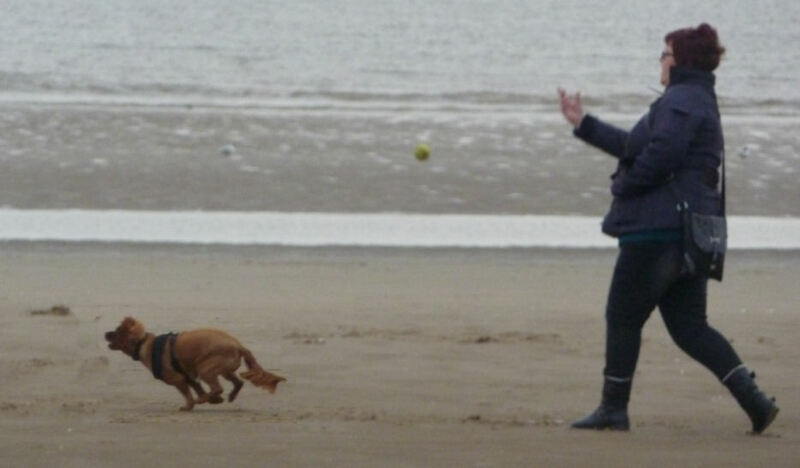 If the ball is not thrown quickly enough the rear leg is flicked impatiently as mentioned previously. When it comes to catching the ball Ruby would make a good goalkeeper as she is extremely proficient at catching the ball with her front paws as well as with her mouth. She can also follow the ball whilst jumping and twisting mid-flight. Whilst out walking she will quite often walk on the white lines painted on the footpath or even walk for a long distance along the coping stones at the side of the road or lock side. Maybe she has a touch of OCD! Needless to say when we return home she is usually ready for a nap. One of her favourite places to take a nap is on the top of the sofa back (see photograph below) with her head next to either mine or Ange's head. If she is awake this position also ensures that she has a good view of the TV or if we are working on the computer what is on the laptop's screen. Incidentally, as I am typing these words on the laptop that is where she is. If you could ask Ruby her three favourite things (besides food) they would be bed, boat and beach! Recently, the sci-fi classic "2001: A Space Odyssey" was shown on TV. Ruby was captivated and watched the whole of the "Dawn of Man" chapter that featured the man-apes (aka missing link? ), occasionally growling at them! On another occasion we were watching James Martin's Saturday Kitchen on the television and when a joint of meat was being cooked Ruby was trying to "sniff the air"... really funny! When she is asleep she snores a lot and dreams a lot as well. When dreaming she does the "running in the sleep thing" with her paws twitching, the "mouth and eye twitching thing" and even wags her tail in her sleep. 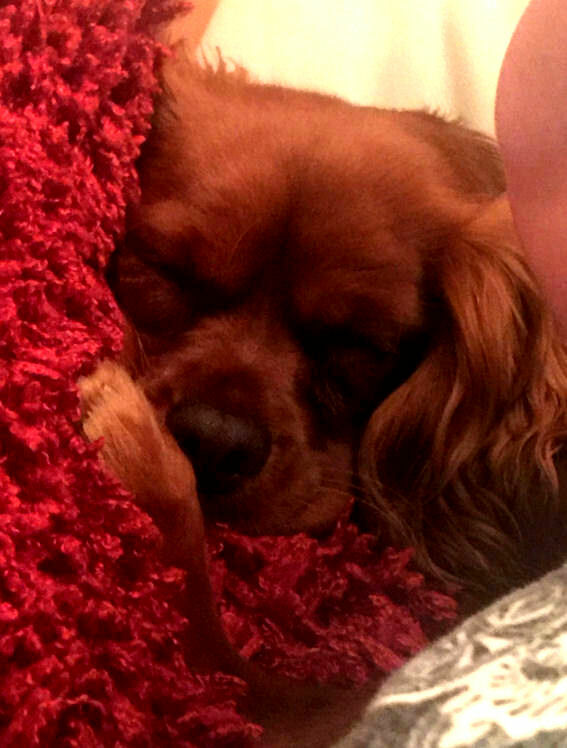 Many of these dreams are accompanied by a vocal soundtrack... she has yelped and barked in her sleep and even woken herself up on occasion as well! 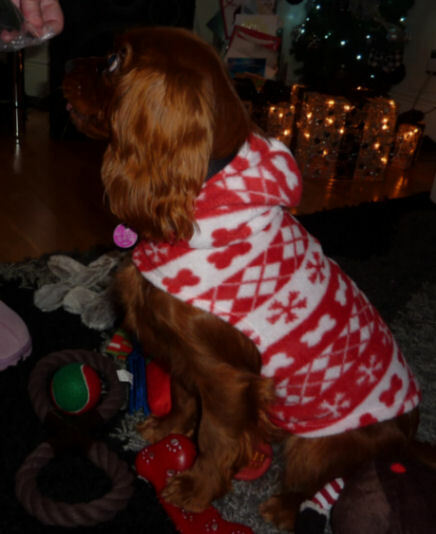 In December 2015 Ruby was looking forward to her first Christmas with us. She had seen us coming in with items that smelt of the pet shop (which she loves going to) and was getting quite excited in the run-up to the Christmas. when we came home with shopping bags that possessed this smell. 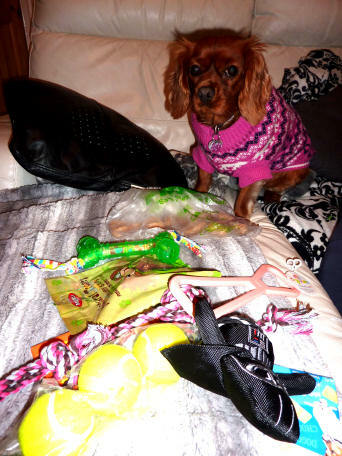 On the big day Santa Paws brought her quite a few presents including a Christmas jumper, toys and a few new balls for her collection not to mention enough treats to keep her going well into the New Year. 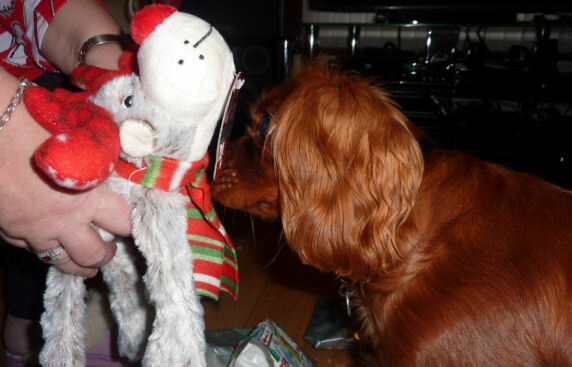 Below are a couple of photographs of Ruby with some of her Christmas presents. 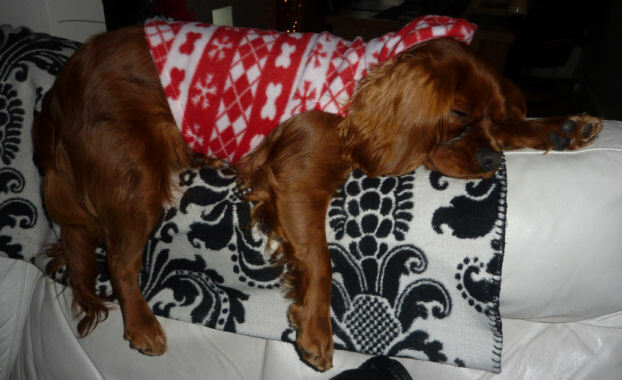 ...and who said that humans were the only ones to fall asleep after their Christmas dinner! One Christmas present of note that Ruby received was an iFetch. 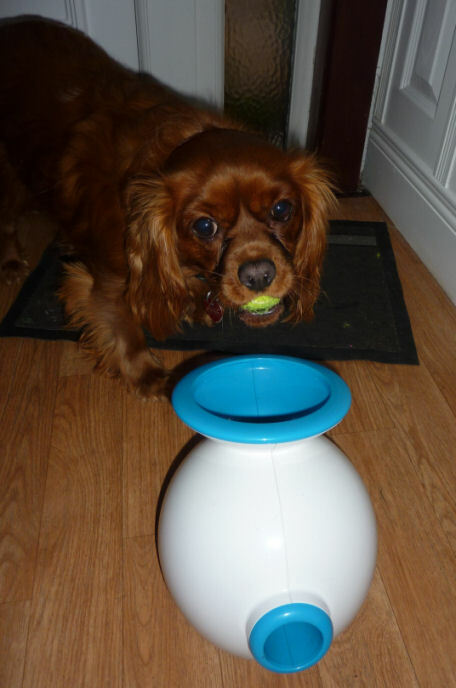 This is a battery powered device that launches or "throws" a small tennis ball automatically when the ball is placed in the device's "mouth" by the dog. We started to train Ruby to place the ball in the device's "mouth" herself and it was not too long before she was playing with the device all on her own without any human intervention except for setting it up for her. It is quite funny when one is doing a job in a different room and you hear the distinctive click and hum of the iFetch when Ruby is playing with it by herself! 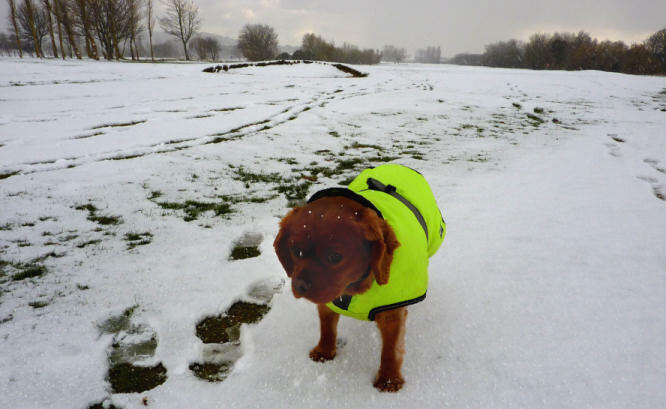 In January 2016 Ruby experienced real snow for the first time. We had previously been amused at her trying to catch hailstones as they came down but snow is a whole different ball game. She delighted in catching snow balls and trying to eat them! For when it is raining and for the winter she has a nice warm, waterproof jacket to keep her warm on outings when the temperature has dropped as well as a flashing LED collar for the dark morning and evening walks. 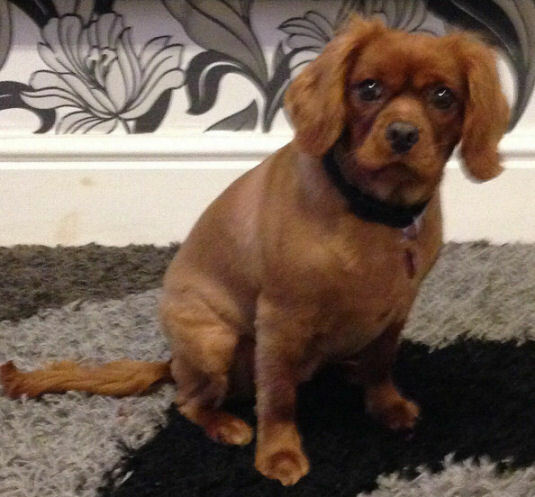 Even though Ruby had been to the dog groomer twice for a trim; the time had come for her to have a full cut. Her "dinner ears" were tatty, her tail and feathers were becoming untidy as was her coat in general which still possessed puppy fur. 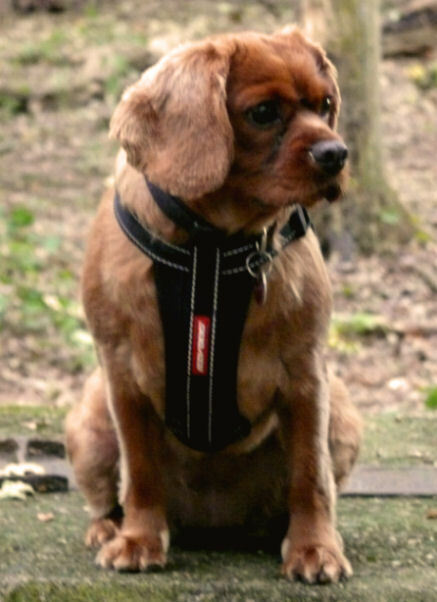 Consequently, near the end of February 2016 we made an appointment for her full coat cut. 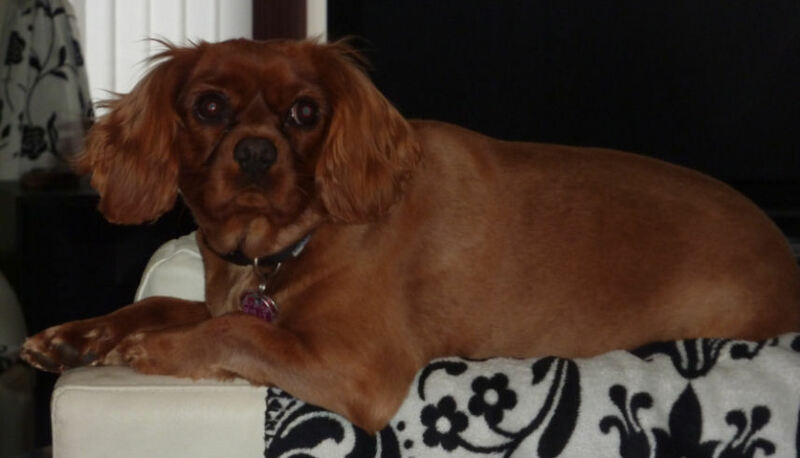 With her fur cut the colour of her coat is a lot lighter with only her face retaining the ruby red colouring. 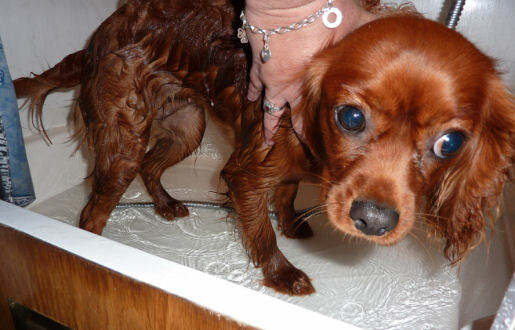 Below is a photograph taken just after she came home from the dog groomer. Needless to say; she will have to wear her nice, warm waterproof coat until her fur grows back a bit and the weather is a bit warmer. 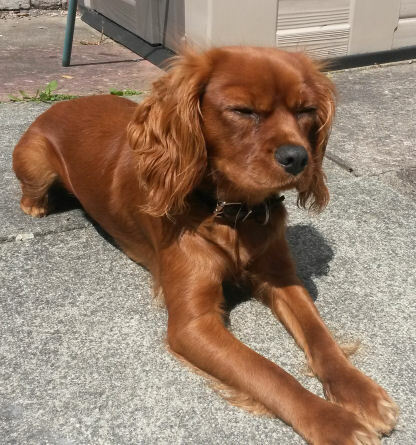 Even though her beautiful ruby red fur is kept short she is brushed daily to ensure a nice glossy and "tat" free coat. Her ears are a different matter. Even though she will lie down and enjoy being brushed when it comes to her ears she was not too keen on them being brushed but as she has grown older she doesn't seem to mind as much. We have a "tat" remover to make sure that any knots (dinner ears) under her ears are removed without pulling and a Wahl Rechargeable Trimmer for trimming bits of her coat that grow faster than others such as her feathers and the hair around her bottom. 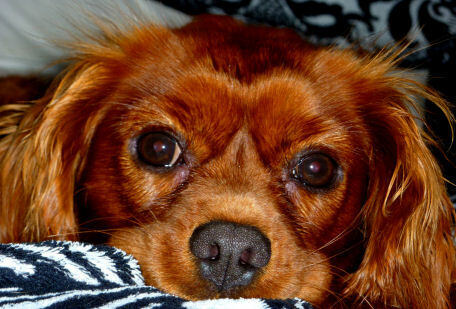 Her tear tracks (prevalent in Cavalier King Charles Spaniels) are wiped daily with special Aloe Vera Eye Wipes to prevent any staining to the fur on her face. Ruby has the run of the house when we are in and as well as having a water bowl in the kitchen she has one upstairs in the bathroom between the bidet and the bath. When one visits the bathroom to use the toilet she will usually accompany you and it is quite funny when standing at the toilet having a pee to see Ruby having a drink from her upstairs bowl facing the same direction at the same time. In the May of 2016 we attended the Federation of Bridgewater Cruising Club's Annual Rally hosted this year by the Bridgewater Motor Boat Club at Runcorn. 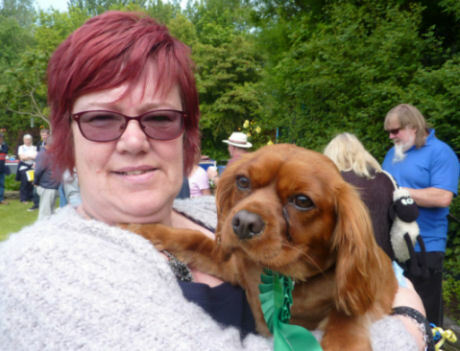 There was a dog competition and Ruby won a prize for performing her "high five" trick. 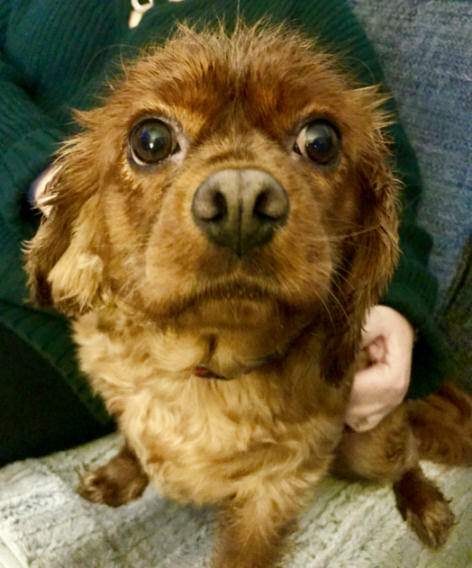 By the time Ruby was two years old she was fully grown and had started to do "big girl" things such as sweeping the floor with her hind feet after going to the toilet and even showing an interest in boy dogs! 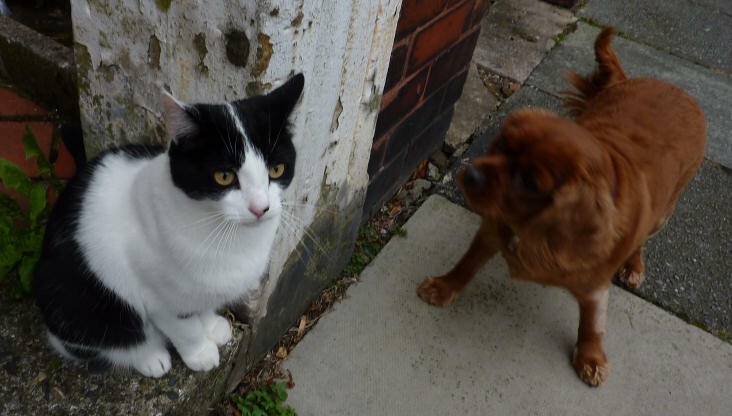 We have always encouraged Ruby to say "hello" to cats. Whilst on our 2016 canal holiday our friends Wendy and Paul Savage cruised with us to Liverpool and were accompanied by the latest addition to their crew... Rosa the kitten. After an initial cautious introduction Ruby and Rosa hit it off and would plat tick for hours on end when we were moored up. After Ruby had completed her morning walk and eaten her breakfast she would "knock" on Wendy and Paul's boat for Rosa to come out to play! 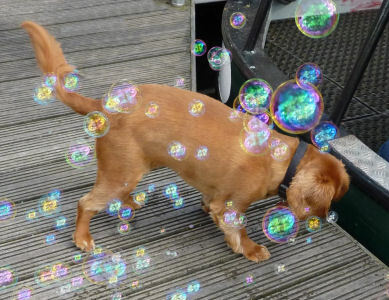 Paul and Wendy also had brought a bubble machine which Ruby found most entertaining. Needless to say, on our return home we had to order one for her from Amazon. On a recent trip to Manchester by boat we made our usual visit to Bury Market. 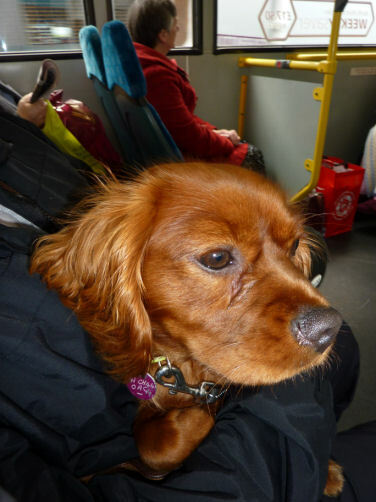 We usually travel to Bury on a Metrolink tram but dogs (even very well behaved Cavalier King Charles Spaniels) are not allowed on the trams so we went by bus. 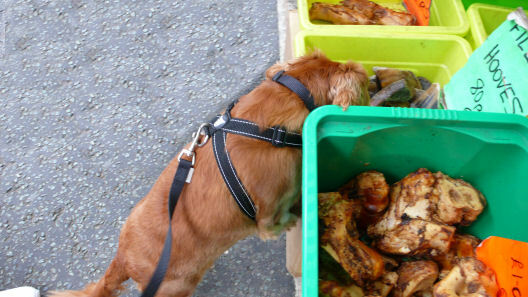 Once at the market we walked around and Ruby spent some of her pocket money at the pet stall on one of her favourite treats... rice bones. Another of her favourite treats are, believe it or not... carrots! 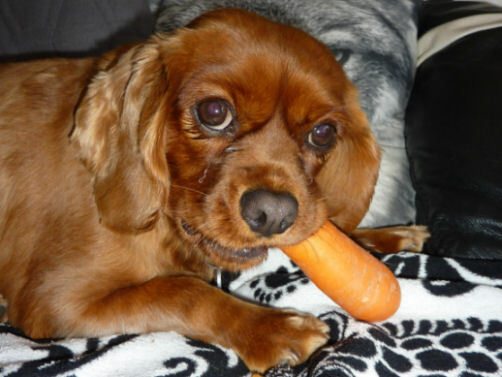 Quite often, whilst we are cooking dinner Ruby will ask for a raw carrot to chew on. She will demolish the whole vegetable in a matter of minutes which is good for her teeth and also provides her with one of her "five a day"! 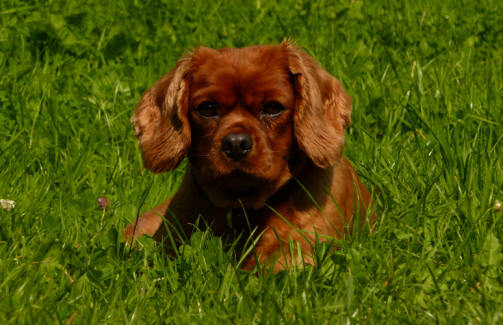 We encourage her to eat food not normally associated with dogs such as the aforementioned carrots, cherry tomatoes and even lettuce! With being ball orientated and necessity being the mother of invention, recently Ruby has now taught herself how to carry two small tennis balls in her mouth at once. It took her a couple of days to figure out how to do it but her perseverance shone through in the end. 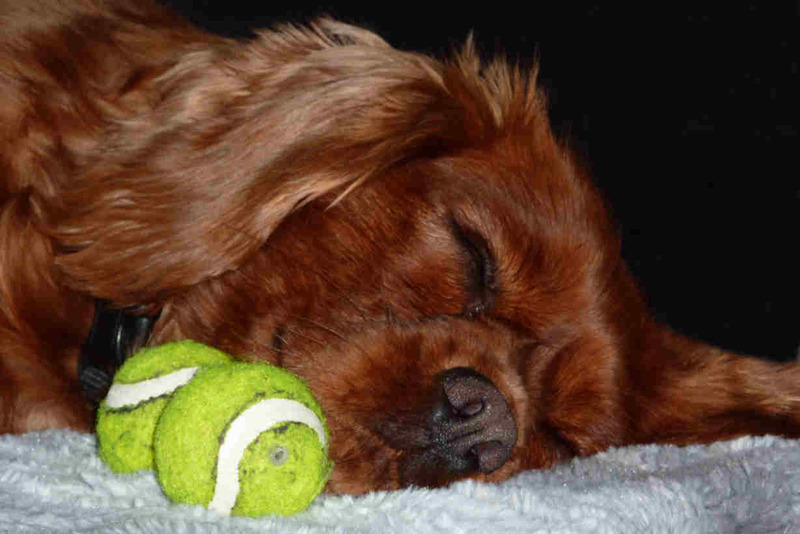 After playing ball for a time her batteries run out and a quick nap is required. Another recent addition to Ruby's list of "likes" is tea. Not cold or even warm but hot... as hot as we would drink it! If the tea is not hot enough she turns her nose up at it. 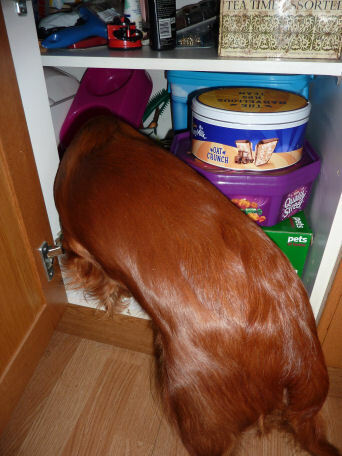 We are careful to make sure that there is no sugar in the tea as it is not good for dogs. 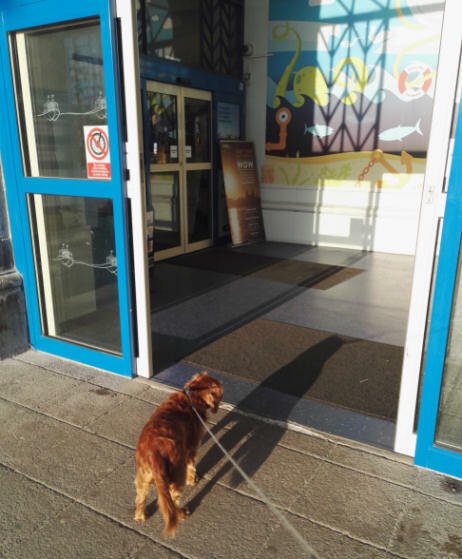 Whilst waiting for Ange at Seacombe Ferry Terminal Ruby discovered automatic opening doors. She walked up to the sliding doors which opened for her automatically and she was initially startled by their operation. Subsequent experimentation lead to a new game... opening automatic doors, walking away when they close and then walking back for them to open again! She carried on with this game for quite a while much to the amusement of on-lookers until Ange appeared. During May 2017 Ruby met a herd of cattle whilst we were on a walk through Marbury Country Park near Northwich. 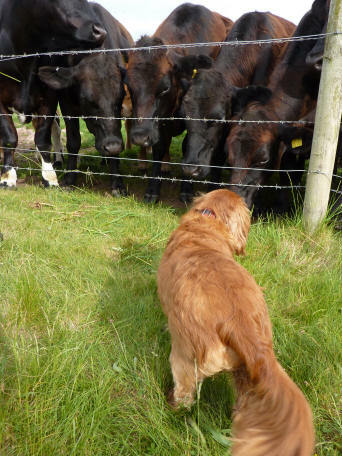 We were impressed by her behaviour, not barking at them and even approaching them for a sniff! Mind you, judging by her friendly behaviour towards cats it is not surprising that she is well behaved around other animals as well. Whilst walking in our local park Ange drove past on her way to the park's car park and Ruby saw the car. I could see her watching the car and when it stopped she ran up to it to greet Ange. So she can now identify our car from a distance! Before Ruby came to live with us we were regularly visited by Rory the cat.. He would waltz into our house and we would give him a small tin of tuna or even cat food that we would buy especially for him. 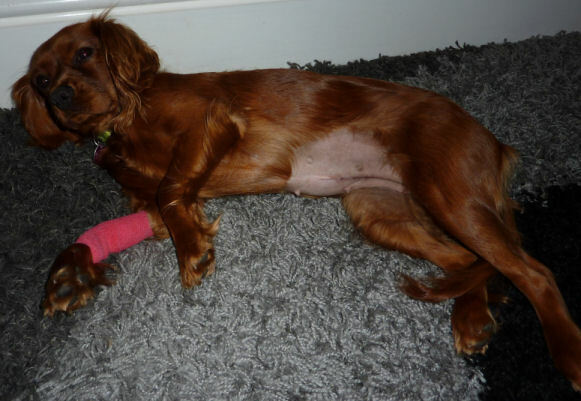 When Ruby came to us Rory was a little unsure about coming into the house and after being struck by a car he lost a leg. When he was allowed out again he struck up a friendship with Ruby and the normal visits resumed. 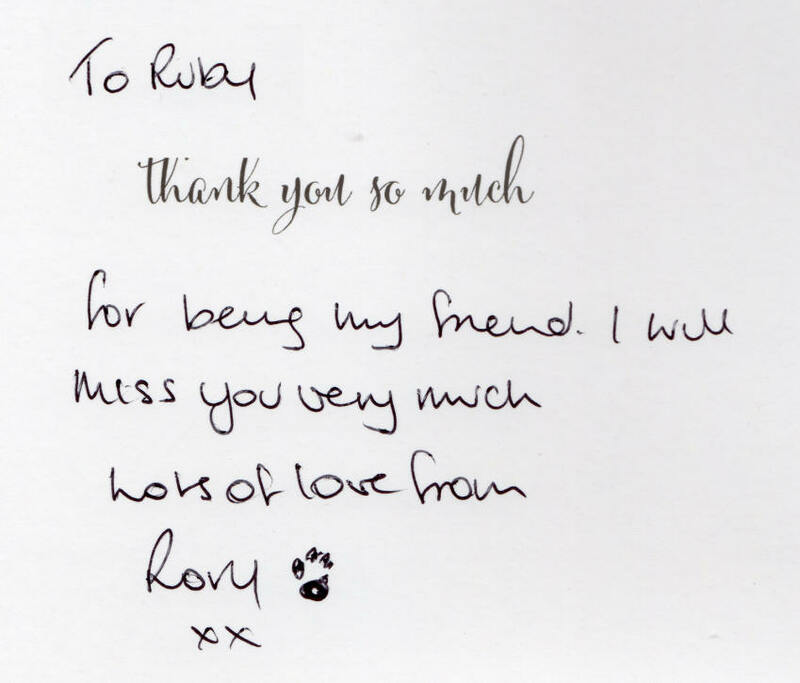 Rory's owner Sheila oved but before she and Rory left a card was put through our letter box thanking Ruby for being his friend. 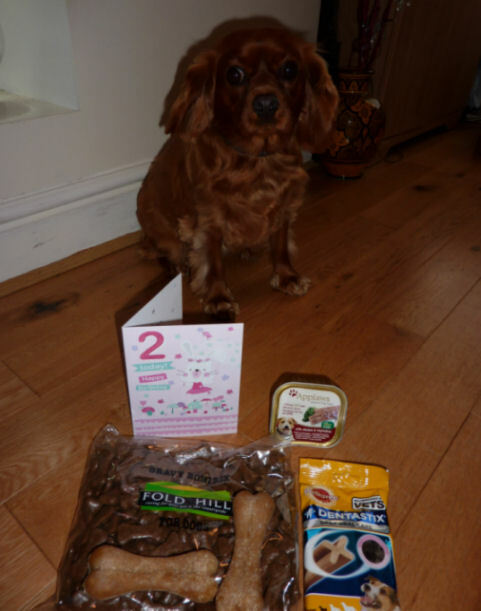 The card was accompanied by treats and sachets of posh dog food. Whilst taking part in Lymm Cruising Club's Invitation Cruise we took our guests to Dunham Massey where we moored for an impromptu picnic on the towpath. 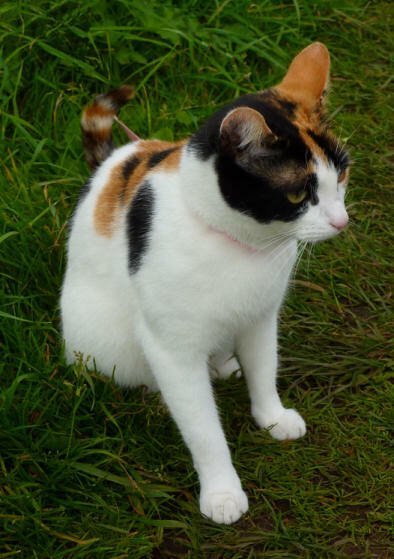 Ruby was playing with the previously mentioned Rosa... our friends' cat, who was on her extended lead. 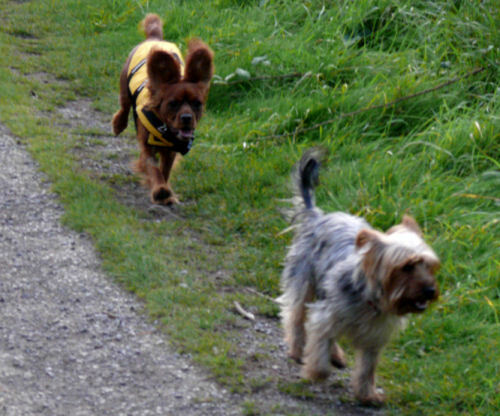 When a strange dog came down the towpath Ruby positioned herself between the dog and Rosa to protect her just in case the dog was not cat friendly. 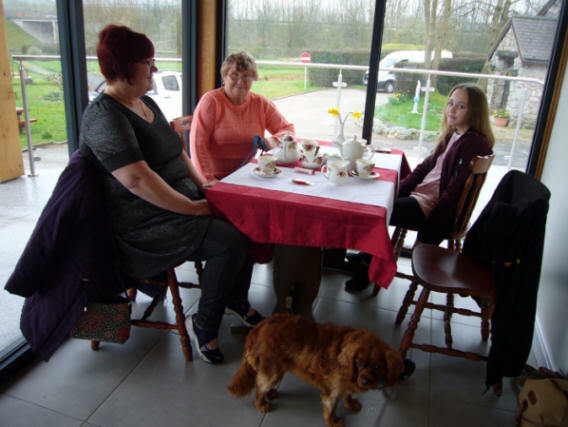 Ruby's behaviour was much to the surprise and delight of our guests, one of whom commented that she had never seen a dog do that before! 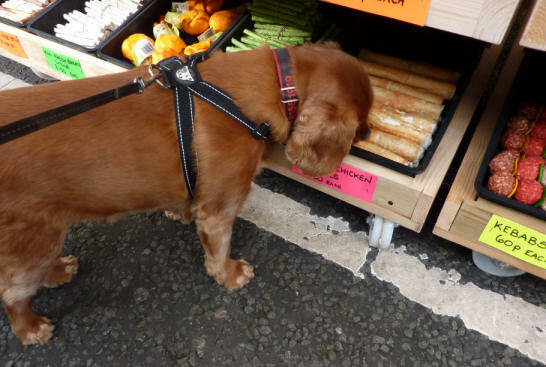 In October 2017, on Ruby's second trip to Bury Market she proved that she has a good memory. As we walked around the market she made a bee-line to the pet stall where she spent her pocket money previously. As she did then she chose which treat she wanted to spend her pocket money on. On the way back to the boat she fell asleep on the bus much to everyone's amusement. 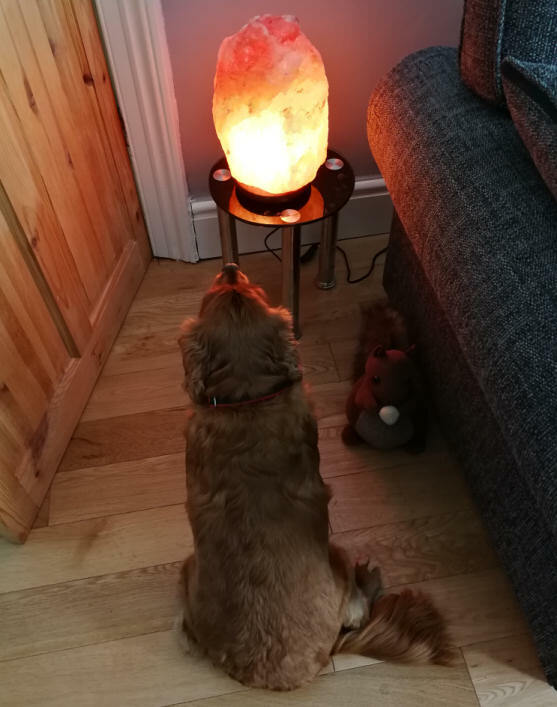 We recently bought a Himalayan Salt Lamp and whilst it was being assembled Ruby couldn't resist giving it a quick lick. 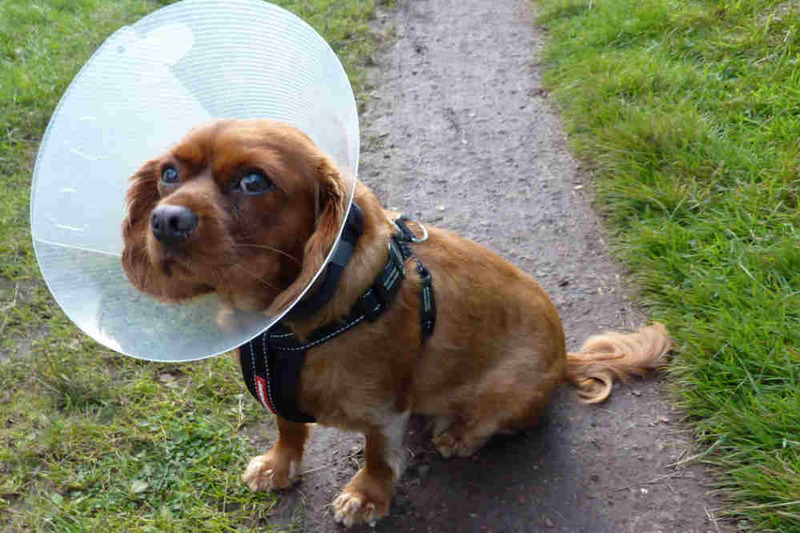 Judging by the expression o her face afterwards I think that she regretted licking it. When it was switched on for the first time Ruby was absolutely captivated by it. She sat staring at it for a good two hours and later on we observed her looking at it whilst lying on the sofa with her head on the arm. Even after it had been in the house for a few days she still goes up to it and gives it a sniff! Late February 2018 saw snow on the Wirral... time for Ruby's thick coat! The 21st September 2018 saw Ruby's fourth birthday. 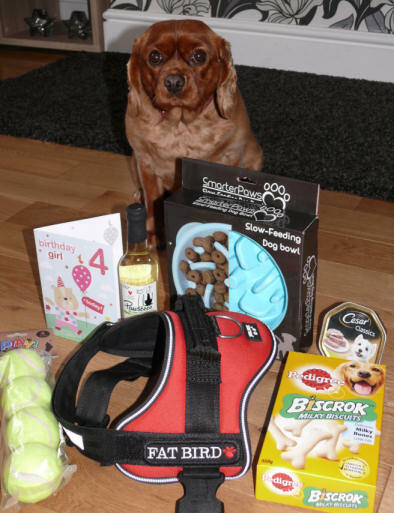 She received the usual array of presents... tennis balls, dog treats, special birthday dinner plus a new Julius K9 harness. The manufacturer's name tag is attached by Velcro and we ordered a pair of customised labels for it with "Fat Bird" embroidered on them. Well, they say that dogs grow like their owners don't they! As I have said previously, dogs grow like their owners and this is most certainly the case with Ruby. When Ange is tired she is moody. When I am hungry I am moody. These traits seem to have rubbed off on Ruby as she exhibits exactly the same behaviours as her owners! Family members have all agreed with us that Ruby possesses most of the traits of the dogs we have had previously (except for Prinny's doziness)... she has the wisdom and faithfulness of Misty, the beauty and playfulness of Prinny plus the intelligence, fun-loving personality and friendship of Maxi. She has grown into a beautiful, well behaved, playful, loving and astute young dog with a good sense of humour. 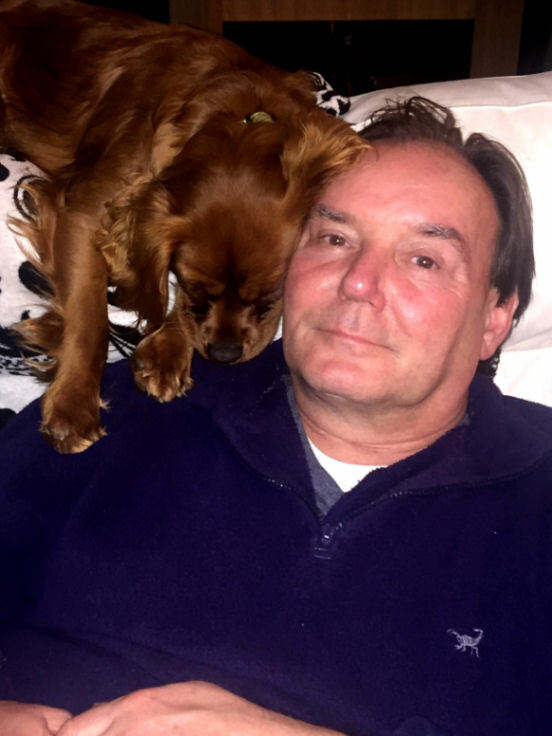 She is affectionate, loyal, protective, good company and seems to be enjoying being a part of our family as much as we are enjoying her being part of it. We are now looking forward to sharing our lives and canal cruising adventures with this wonderful canine addition to our family/boat crew. And nibble on a human’s chin. These human beings that I see. And share their bed with me at night. We are not religious people but we hope that you enjoyed reading this short prayer (aka poem) as much as we did.